Plants need love as everything does. Now water it smarter with this Hydration kit. 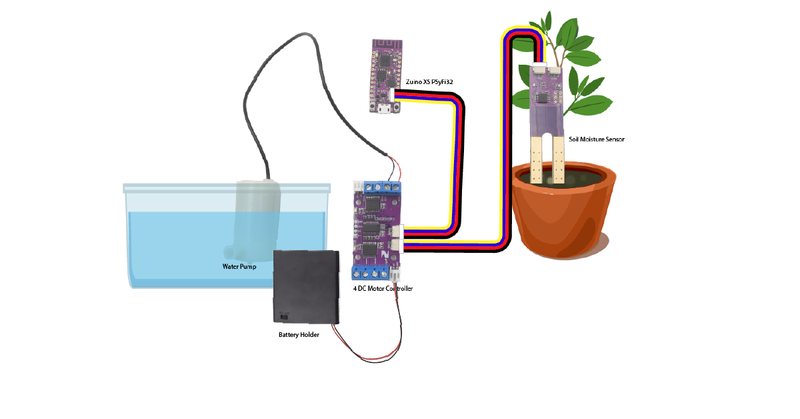 This kit includes a soil moisture sensor, IoT brain Psyfi32 (EPS32 based), a motor driver and a water pump. It is intelligent enough to read your plant's moisture rate when it needs the H2O boost, and sufficiently waters your plant at the right time and moisture level! No more dying plant, no more neglecting your pot of green, no overfeeding your plant with H2O! Qwiic compatible modules - minimal configurations and easy to set up, with our step by step tutorial and demo code, even a beginner maker can set it up in no time! This kit also serves as a great educational kit tool to be used by kids in schools.